Remember when I was going to do an article about the 15 Theros block gods and then when I started writing I only managed to cover five of them in a 3,300 word span? That was pretty crazy. If you don’t remember, what the hell is wrong with you? This is the first article you’re reading? You just clicked on a title that said “Part 2,” which is akin to saying, “You don’t need to see Highlander 1 to understand Highlander 2 and Highlander 2 is my favorite movie,” and of course you like Highlander 2: you’re a moron. Go back and read the first part. Good grief. So now either you read part one last week or you took me admonishing you in stride and went and checked out part one before coming back. That’s good. Let’s sally forth, shall we? We’re going to talk about some multicolored gods today and I am planning on getting through either five or ten of them. I figure I can shave off some words by not having to reintroduce the topic and explain my point ratings this week, but if I only make it to five, it’s because I had a lot to say about each one. Look, people, I’m not paid by the word, I over-write as a labor of love and sometimes I have a lot to say about a topic. We ready to jump in and look at the golden gods? Let’s do the dirty. Let’s start with the Gods of the Born of the variety and see how far we get. We could end up with a part three next week. Sorry about all the value. Okay, remember when I said that the $1 being paid for Heliod established a floor for dealers who were not going to offer less than $1 for a legendary mythic god? Guess they haven’t gotten the memo that they’re paying $0.79 currently for a god that peaked at $15. Japanese players concocted a wacky UW deck that made good use of all of the card draw. An EDH deck with Brago could really get there with Ephara, drawing extra cards, and she could be at the helm of her own deck, chock full of token producers and cards like Mistmeadow Witch. It says “each upkeep,” guys. It scales up to get better in multiplayer. So why don’t EDH players seem to care? For one thing, they have Consecrated Sphinx and Rhystic Study that aren’t a pain to get an advantage from. Want to hear the good news? This card likely can’t get cheaper. If this hits $1 or lower at rotation, it’s so low-risk to scoop a handful of copies that it’s not funny. I am a 3/5 at $1ish at rotation since this card has real potential. It’s in awkward colors for creatures, but not for enter-the-battlefield shenanigans. Is drawing a card every upkeep because you have a Deadeye Navigator and Stonehorn Dignitary lock the good part of that situation or is no one ever attacking the good part? Hard to say. I am not nuts about this card for much other than its price, though. What? This is a $10 to $12 foil. That’s really surprising considering how tepid the EDH community seems to be about this card. It’s certainly played as a commander and googling “Ephara EDH” shows pages of results. I think that this is too expensive, though, and maybe Ephara is establishing the price floor for the buylist value on a foil the way Heliod seemed to for non-foil. If I could pay the $5 dealers are paying now, I’d give this a 4/5 at rotation. I’m not sure that’s a possibility, but you never know. I think this has upside, especially in foil, and buying in at dealer price is always a good call. 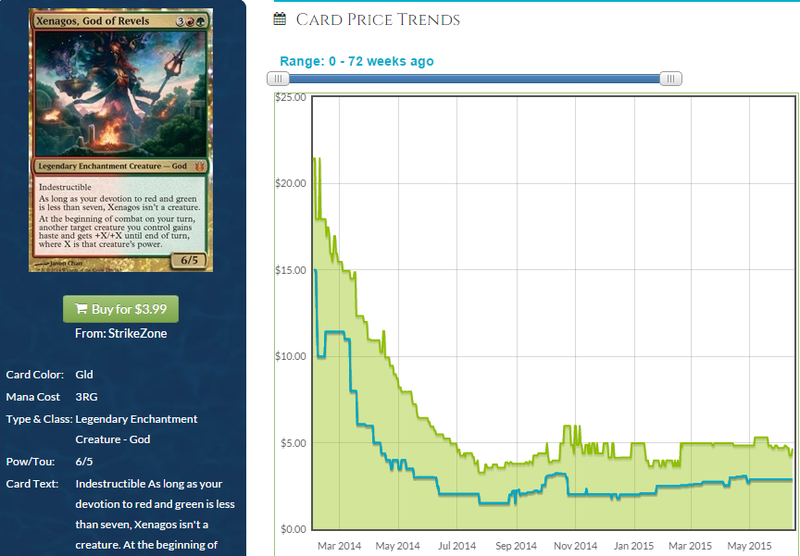 Foils aren’t going to fall as much at rotation, but I also think its current price may not be the ceiling, especially since it’s been flat for so long with no help from Standard. This feels about right to me. It’s not useful at all in Standard (often called the worst of the 15, in fact), but it’s fun in EDH and useful both as a general and as an inclusion in the 99. Karametra is only starting to see some of her vast potential tapped. Does Karametra have upside at its current price? Potentially, but dealers have backed off and we see a large spread here for such a reasonable card. Still, the dealer price is about at rock bottom and we’ve seen Karametra’s price demonstrate the ability to spike a dollar for seemingly no reason. I am a 4/5 on these if they hit $1 or lower at rotation. This could be a $5 card pretty easily in a few years. I have literally no idea what’s going on here. 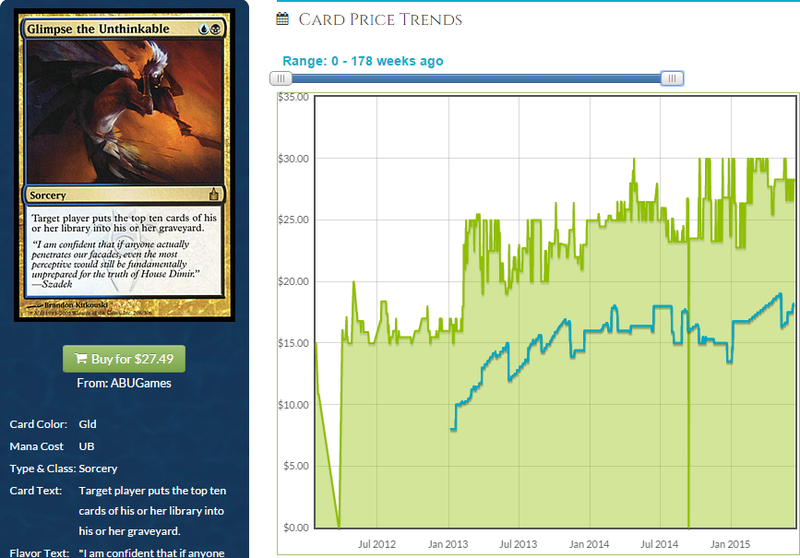 The spread is increasing in the non-foil version but the spread is shrinking (though it appears cyclical) in foil. 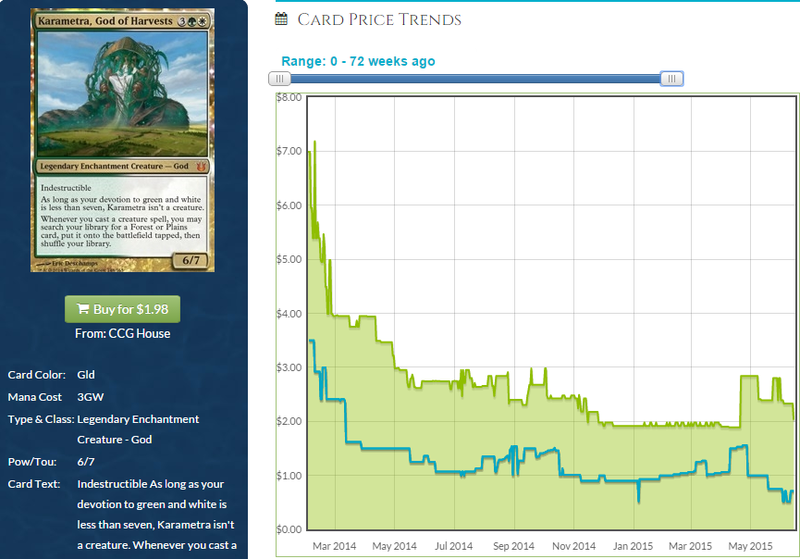 The price has been just about flat for a year, which is odd given how useful Karametra is as a (tier 11) general. I expected this to go for more than Ephara, and not only is it going for less, we’re seeing practically no price movement, which means practically no sales. The fact that no one else seems super excited about the foils makes me not super jazzed. I’m like a 1/5 at its current price and a 2/5 at its current buylist price and a 3/5 at its January buylist price. This could be a $20 foil, but it could take a very long time to get there based on what we’re seeing now. I’m a little surprised all the hype surrounding this card is not doing more, but we may be seeing a regional bias in my experience. Ephara is showing better behavior than Karametra is and I’m basing my analysis on the numbers, not anecdata. I think Karametra could be better than the community is giving it credit for, but I think Ephara is showing better upside. Okay, this is confusing, too. 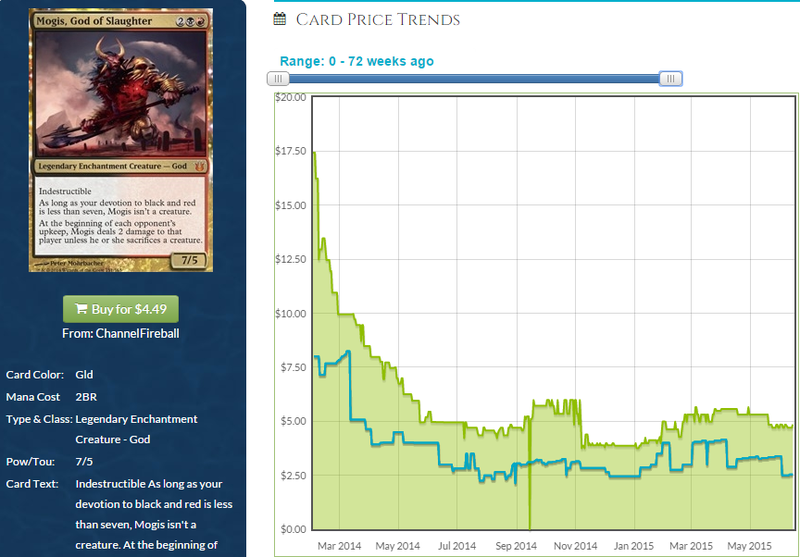 Mogis‘s price is behaving like it’s not useless in Standard, but that’s not the case. It’s a fun EDH general to be sure, but this is going for Purphoros money right now and Purphoros it is not. Dealers are backing off and we’re seeing a rapid increase in the spread, but only to where it should be. For a while, this was a high-value, low-spread card and that indicates a lot of EDH play. That indicates a lot of upside as well. Given that it’s currently feeling overpriced yet not getting a ton of its value from Standard play, I don’t know what rotation is going to do to this card. Probably something, since people who are rotating their stock tend to do so at rotation and will dump these out of the binders they’ve sat in for a year. 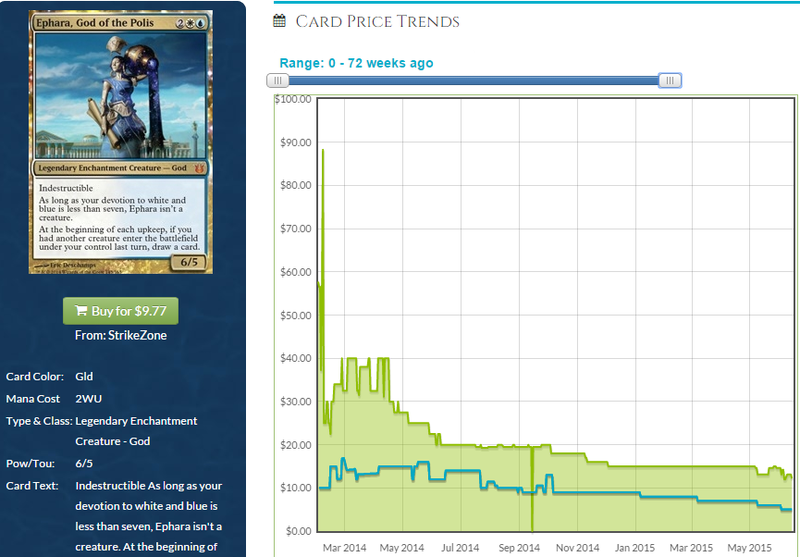 Still, with its EDH utility making up the bulk of its price and EDH not rotating, this could barely budge. I think this has some mild upside at its current price, but not a ton. I’m a 1/5 currently, but if this starts to approach where the buylist price is now, I’ll jack that to a 4/5. This has real upside if the current numbers are to be believed. He’s certainly a good commander, but interestingly, I don’t know how much I like him in the 99 a ton of the time. It’s not like anyone was really playing Blood Clock in EDH before. 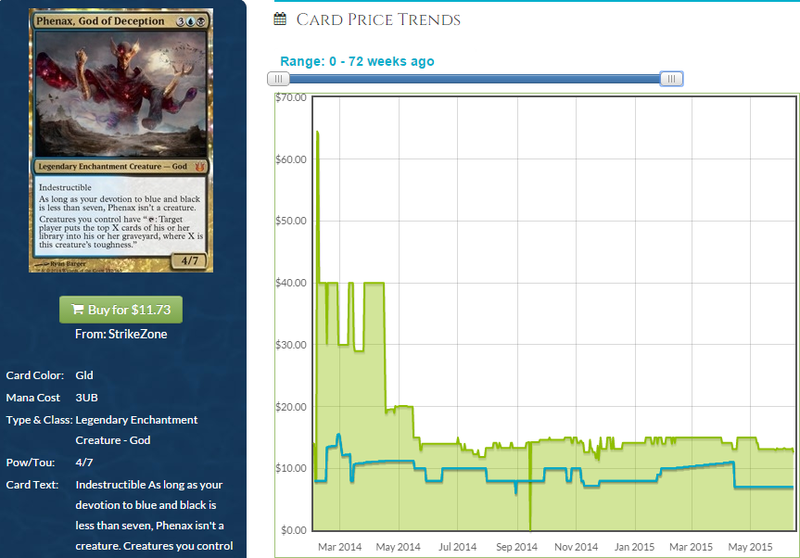 Full disclosure: I don’t know Mogis’s foil price and I’m going to check it next so we’ll discover it together. I’m predicting it will be pretty high since Mogis is mostly good as a general. Annnnnnnd the foil is lower than I predicted. All of the Born of the Gods foil gods are practically the same price so far. That doesn’t make a whole lot of sense to me, frankly. Let’s do some analysis and try to get to the heart of what’s going on before we move on to the last two from this set. 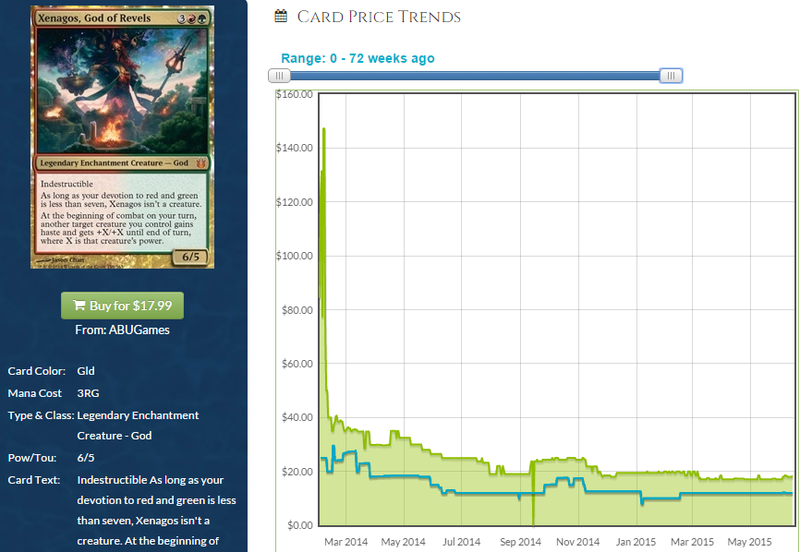 There is a lot of variance in the gods’ non-foil prices, which appears to be meritocratic. The foils have a price that says to me “supply is very low” and the modicum of demand for each one is making $12 just about the minimum price based on low supply and non-zero demand. Enough non-foil copies exist to sate demand, but enough foils do not. We expected that: not a ton of Born of the Gods was opened and prices have been a bit wacky. With the price of a foil god seeming to be enforced by supply more than demand—but demand not being high enough to push it outside the weird “$10 to $15 zone” or low enough to make it tail off toward nothing—we’re seeing a pretty predictable price for gods from this set. 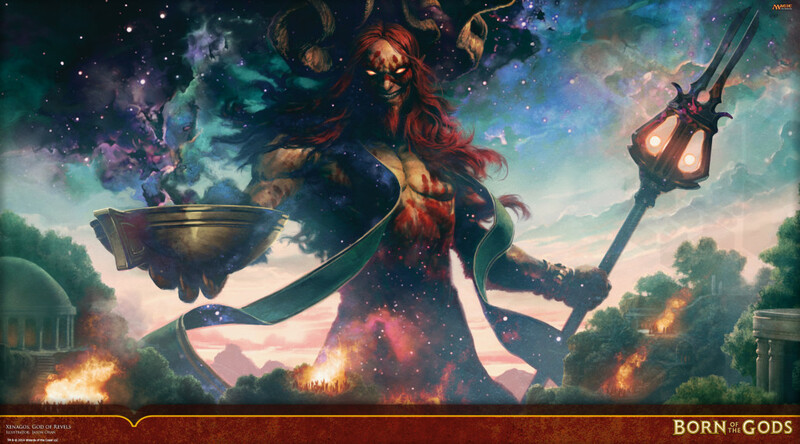 I don’t anticipate that for gods from the next set nor for Xenagos, which has hella demand. 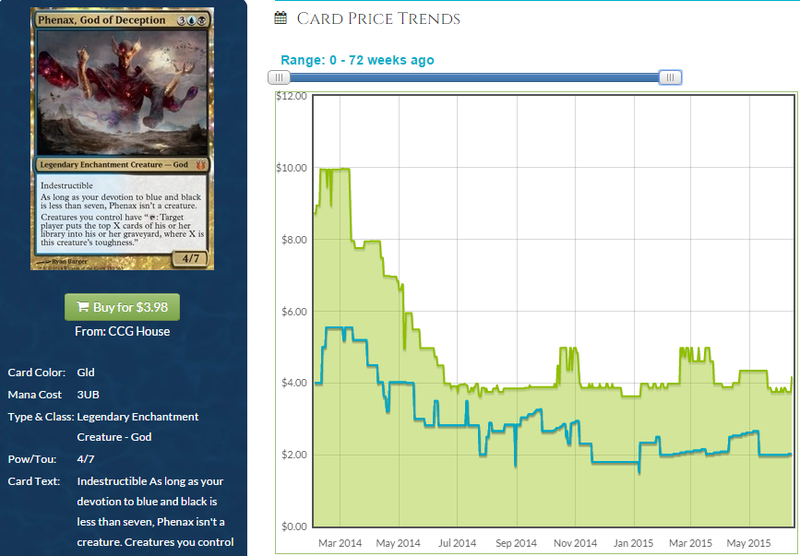 As for Mogis, I think there is not a ton of upside at his current price. If he falls at rotation, I may go as high as 3/5 for the foil, but with low supply propping up the price, it’s hard to gauge where it should be and guess how long it will take to get there. I think its current price is where-ish it should be, and I don’t know how much upside there is from there. If you’re surprised by Phenax being worth more than $2, you must not know any casual players. If you’re surprised by it being less than $5, you must be me. I’m surprised. I realize this isn’t very good in EDH because who wants to mill 300 cards when it’s so much easier to deal 63 damage? Plus, other players are attacking, so you want to get on board so you’re not the only one pursuing that angle. Still, mill is a thing in EDH (though not to a great extent) and this is the general to use if you’re going that route. I think this card’s price is predicated more on casual than EDH. Why do I say that? Mill will always be a thing for casual players, and they aren’t restricted to one copy of Phenax, so that gives him considerable upside compared to an EDH-specific god. Not only that, but this is the only god that helps mill strategies, which means it has an edge over the others. As it stands, I hate it at its current price, but I’m a 4/5 if it falls even halfway to its current buylist price. This card has real upside, is hard to blow us out with a reprint like we saw with Mind Funeral, and I think sellers will move more than one copy at a time. This isn’t a terribly EDH-y call, but there you have it. See, this only adds more fuel to my hypothesis! 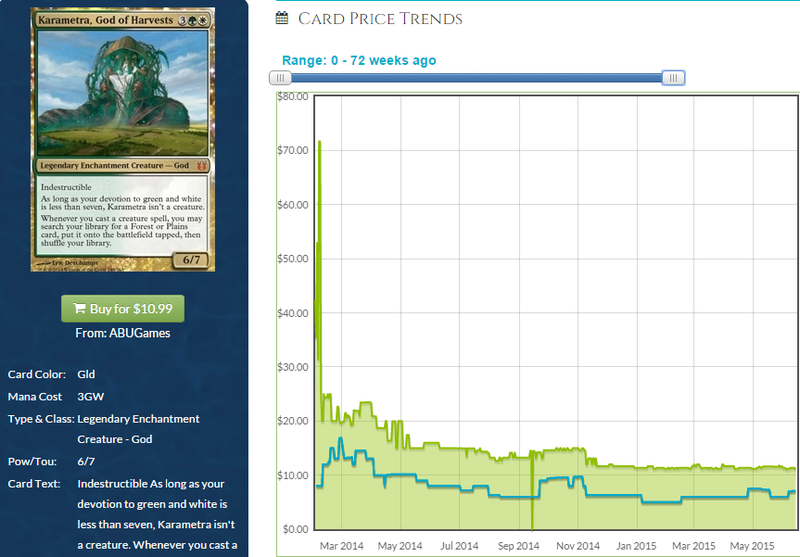 Why should a card that’s not played as an EDH general much be the exact same price as the others? And look how flat the price is, like all the others. What we’re seeing is what we hypothesized earlier. You won’t be super surprised to hear that all the factors we discussed earlier about Mogis plus the fact that this is a bad commander (though not unplayable) means I am not bullish at all at this, even at a much cheaper price. I don’t know how much upside the foil has, so while I’m like a 4/5 on the non-foil, I’m a 1/5 on the foil. Buy in if you want, but it’s a high buy-in price and it hasn’t demonstrated any ability to get there in the future. I’d rather buy foil Nemesis of Reason, personally. Stay away, but just know that mill will always be at least attempted and the non-foil has upside. Now we’re hitting another money god, this set’s Purphoros. How am I going to like him at his current price? Lots. I like him lots. Not only is he an auto-win with Prossh, he’s a solid roleplayer in the 99 and also a good general in a deck full of big, stupid hydras. He’s even a good general for a deck full of creatures with infect. Boom. He’s also pretty reasonable, price-wise. Under $5? I am bullish on this guy already. Dealers appear to be, as well, because despite a flat retail price, the spread is shrinking. Will the buy price be close to where it is now at rotation? Will Xenagos not fall at all? All I know is that this card has real upside and I like it about a 4/5 at its current buylist price, which may be about where it is at rotation, honestly. Xenagos is the second-best god we’ve reviewed so far, his price is very reasonable (reflecting real upside, especially coupled with a dip at rotation), and he puts in work. 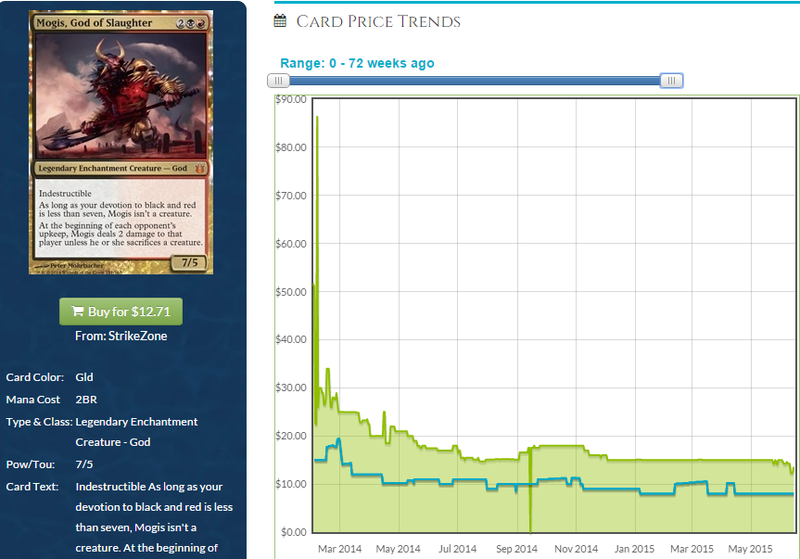 Lots of people are focusing on how cheap the planeswalker Xenagos is, but ignore this guy at your peril. He’s godly. This card has a little bit more value than the other four in this set, but not as much more as you’d think. The spread is very low, but we’re seeing the same phenomenon for all of the gods: the price doesn’t seem to reflect the non-foil price (and therefore demand) as much as we’d hope and they’re all within a few bucks of each other irrespective of popularity of playability. That’s cool! The spread is so low right now that I almost want to say buylist price is more than I want to pay, but I think this foil has some upside, especially since it’s such a cool commander. There you have it. I didn’t write quite as much as last week (and it’s wasn’t as humorous—sorry), but I still don’t have room to cover the last five gods. Honestly, these gods all shared some attributes and it took us a bit of work to uncover what was going on. And having a part three lets us delve into what’s unique about the last five gods. I’ll be back at it in just a few days, so let’s get some conversation going in the comments section and wrap this little exercise up next week, in plenty of time to get ready for rotation. Until then! 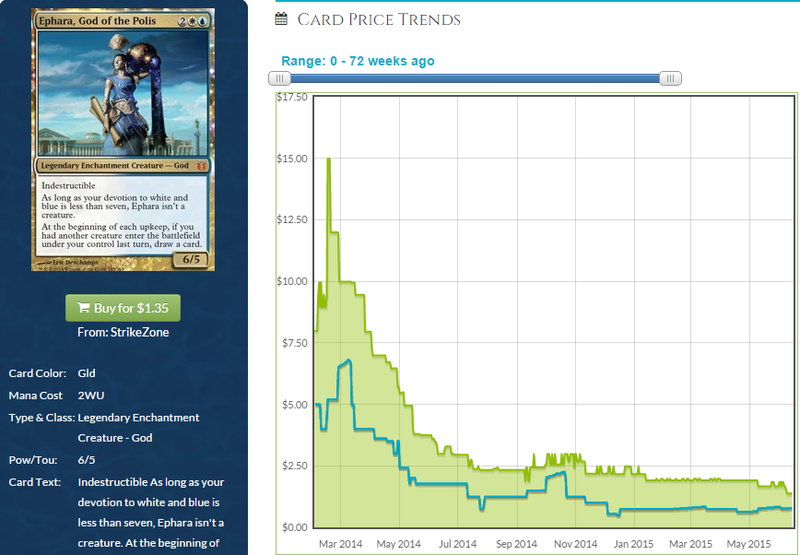 Previous PostMTGFinance: What We’re Buying/Selling This Week (June 14/15)Next PostUNLOCKED PROTRADER: Retrospective: GP Richmo…er, Charlotte. Whatever. Another cracking read Jason, and i certainly found enough nuggets of humour to get a luagh or two! I didn’t realise how low the price on Xenagos is, I think I might have to scrape some small amount of cash together to grab some copies. Here in the UK, I have seen retail prices as low as £3.32 (about $2) for Xenagos which I think is insane. Just got to keep my eye on when they restock and how much that moves the needle on him. Sweet article, looking forward to part 3. Did you mean the cards are 2 pounds, which is about $3.32? Either way, that’s dumb for Xenagod. At that price, why even wait to pick them up? Target Xenagos, Purphoros and any gods I mention in next week’s article in every trade, go in for cash or try and convert your soon-to-rotate junk on pucatrade. You seem convinced, so make some plays.